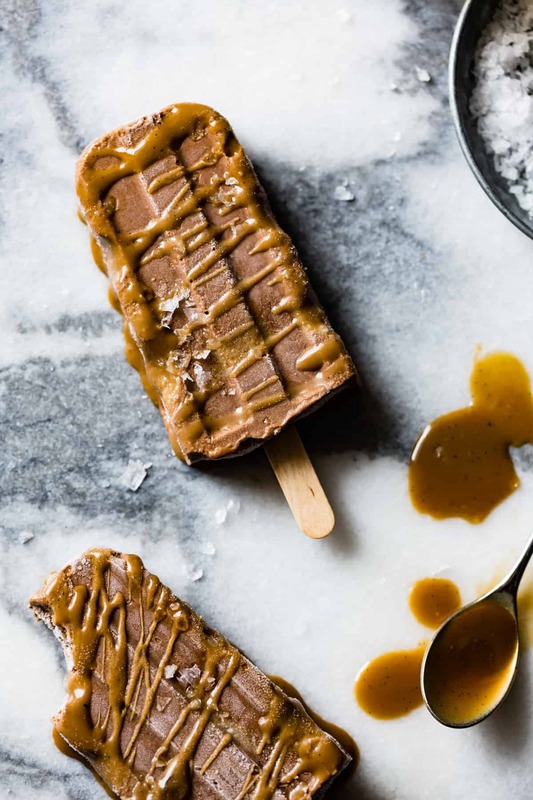 Creamy chocolate and date chia pudding and an easy coconut caramel sauce make the most lusciously healthy Vegan Salted Caramel & Chocolate Swirl Popsicles free of dairy and refined sugar. Adapted from Glow Pops by Liz Moody. 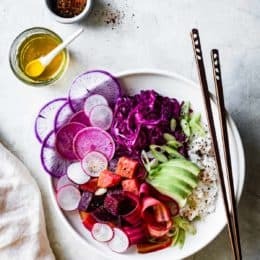 I just got back from teaching a food styling and photography workshop in Sebastopol with Sarah, Gerry, Carla, and 12 fun and talented attendees (more on that soon!) I wish we’d had batches upon batches of these popsicles because it was HOT. Scratch that. 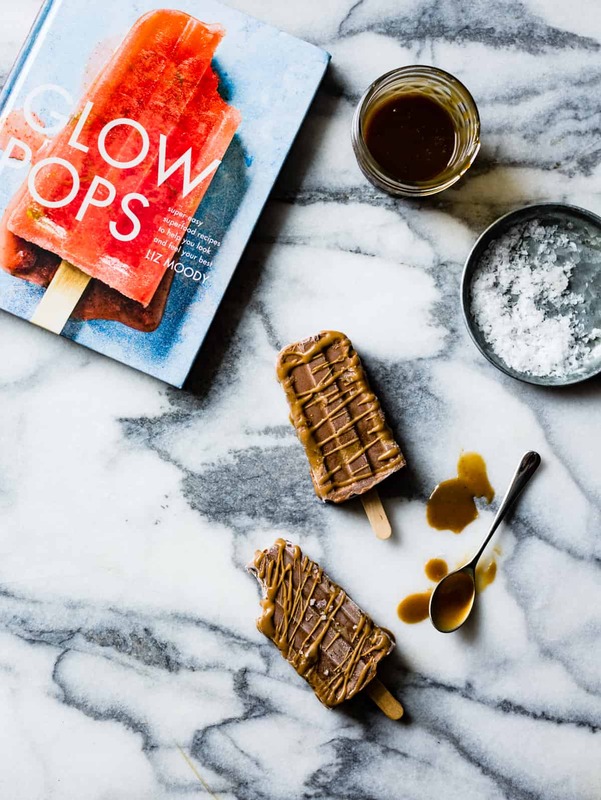 I wish Liz had been there churning out all of the delicious popsicles from her beautiful new book Glow Pops: Super-Easy Superfood Recipes to Help You Look and Feel Your Best. We would have been set for every meal of the day. 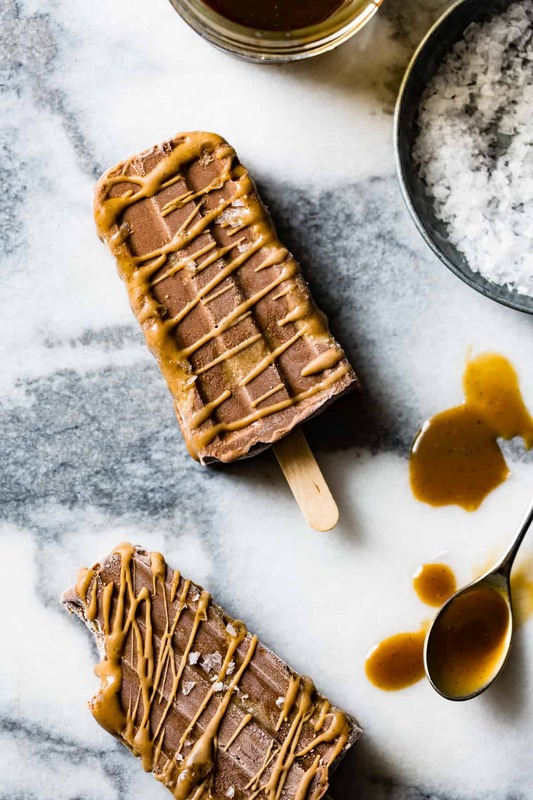 While these Vegan Salted Caramel & Chocolate Swirl Popsicles are to die for, I’m especially excited to share Liz’s genius vegan caramel sauce recipe with you today. It has just 2 main ingredients – coconut milk and coconut sugar – plus a little vanilla, salt, and coconut oil. Unlike normally tricky caramel sauce, this comes together more like a cajeta or dulce de leche. Just stick the coconut milk and sugar in a pot and let it cook down, stirring occasionally, until the sauce reduces into a thick caramel. The coconut sugar gives it a deep golden hue and infuses it with tropical coffee notes. I want to eat it on everything. I doubled the recipe because I knew I’d want extra to drizzle all over my body popsicles, and since I like my food to essentially be a salt lick (especially when it’s as hot as it was in Sebastopol last week), I sprinkled the pops with a bit of flaky salt for crunch. The chocolate popsicles are even easier; just whiz some soaked dates, cacao powder, chia seed, and nut milk (I made a mock cashew milk using cashew butter and water since that’s what I had and it worked great). 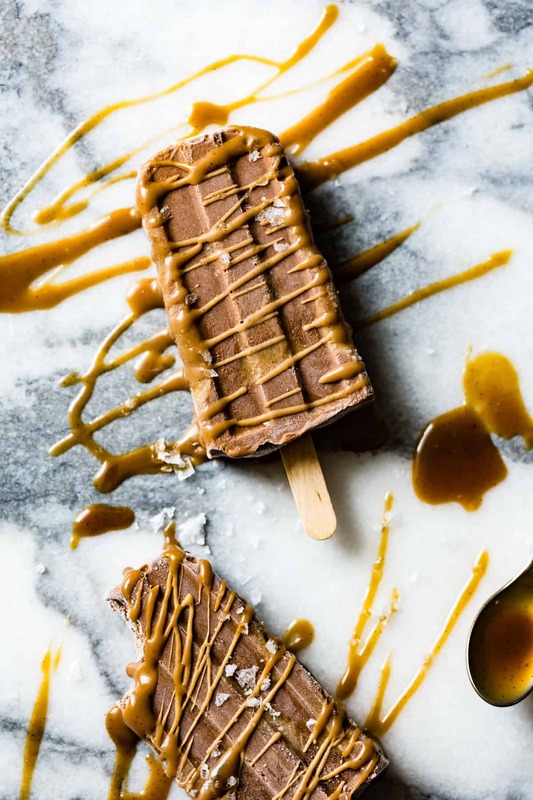 You’ll be hard pressed not to eat the pudding straight from the blender, but if you manage to spoon it into some popsicle molds layered with silky caramel sauce, these pops will be your reward. Did I mention how incredibly nourishing these pops are? Cashew butter and coconut are loaded with healthy fats, dates and chia are full of fiber and nutrients, and cacao powder gives a dose of antioxidants. These pops satisfy on so many different levels. And they’re as appropriate for dessert as they are for breakfast or a midday treat. 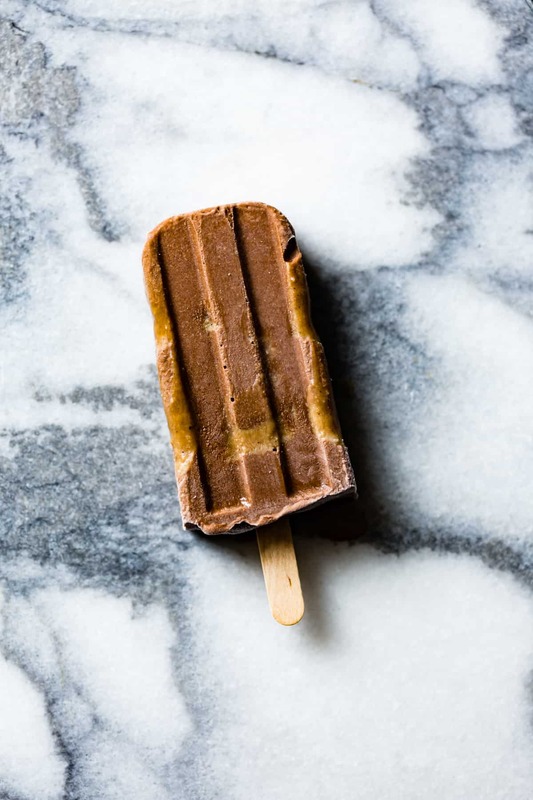 …right after I have another one of these Vegan Salted Caramel & Chocolate Swirl Popsicles. I hope you’re keeping cool in the Northern Hemisphere and enjoying the bounty that summer has to offer. And hey: it’s popsicle week! Check out the abundance of gorgeous popsicles across the blogosphere right here. 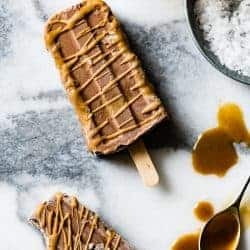 I've included a double batch of the coconut caramel sauce so that you'll have plenty extra to drizzle over your pops, swirl into yogurt or ice cream, lick off of spoons, and enjoy in and on everything. Recipes adapted barely from Glow Pops. In a medium-small saucepan, combine the coconut milk, coconut sugar, and vanilla pod and scrapings. 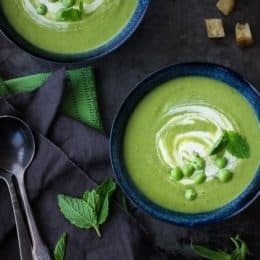 Bring just to a simmer over medium-high heat, then reduce the heat to low and cook, simmering gently and stirring frequently with a flexible heat-proof spatula, for 30 minutes. The caramel should be thick and saucy like warm caramel or butterscotch sauce. Stir in the fine salt and coconut oil. Transfer to a heat-proof jar and chill at least 1 hour. If the sauce gets too cold, warm it to a pourable consistency before proceeding. In the bowl of a sturdy blender, combine the soaked dates, water, cashew butter, cacao powder, fine salt, and vanilla. Blend until smooth. Stir in the chia seeds and let sit 30 minutes to thicken the seeds, then puree again on medium-high until very smooth. Add a splash more water if the mixture has trouble blending. Starting with the chocolate mixture, layer all of the chocolate and half of the caramel into 6 or 8 (3-ounce) popsicle molds in 3 or 4 layers, alternating a big spoonful of chocolate with a small spoonful of caramel. Chill the popsicles for 1 hour, then add popsicle sticks and freeze until solid, at least 12 hours. 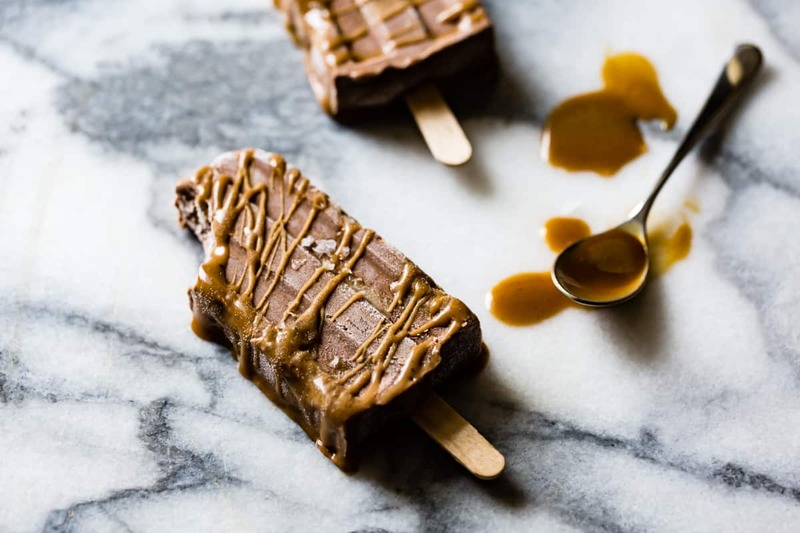 When ready to serve, remove the popsicles from their molds and drizzle with caramel (warmed to a pourable consistency) and a few small pinches of flaky salt and serve immediately. What. Is there a button I can push that makes the picture of the popsicle into a real popsicle instantly?? 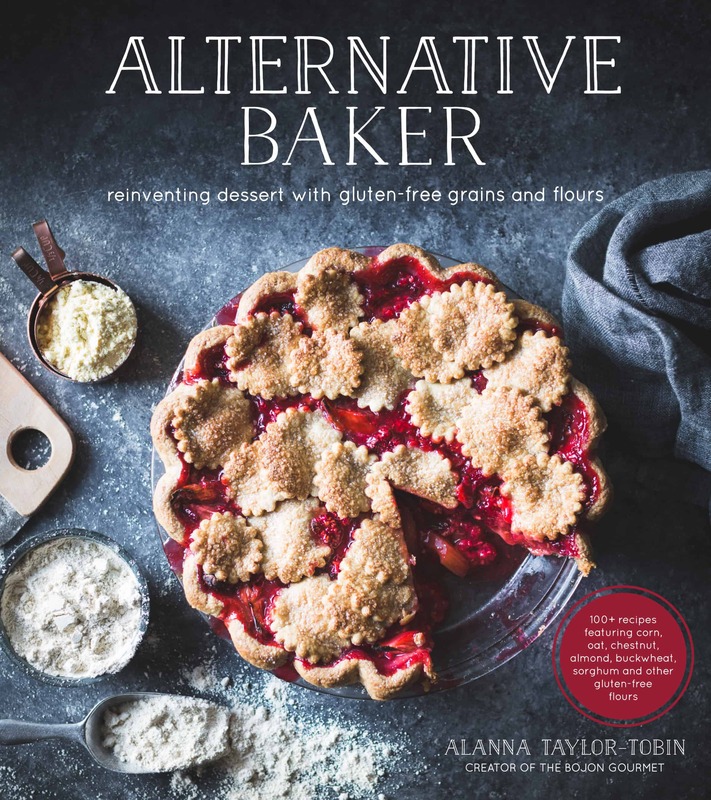 Also, I think I need this book and a second freezer. These popsicles look and sound perfect, they have all my favourite sweet ingredients and I definitely have to make them over the summer! It’s so hot here, I wish I have one now! These look brilliantly delish! I love the styling too. True: When I saw popsicle day, I was like–where is bojon’s ? Because I knew it was gonna be good. You never disappoint, and coconut caramel is a grand discovery! YOU! These pops are my favorite in the book (shhh, don’t tell the rest) and you made them SO gorgeous. I’m tempted to go whip up a batch now, but #lazysaturday. Thank you for your sweet words and gorgeous posts (today and every day). These look amazing! Perfect summer recipe. The salted caramel and chocolate flavors together sound fabulous! 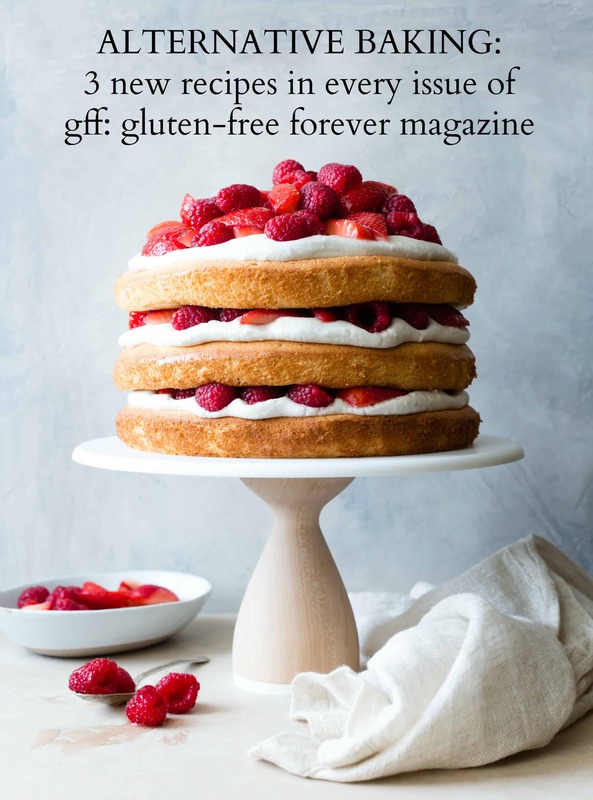 thank you for sharing this, love that it’s not only refined sugar free but healthy too with healthy fats, etc as you describe, I’ve gotten to the point that super sweet doesn’t work for me these days anyway so happy for all of this! 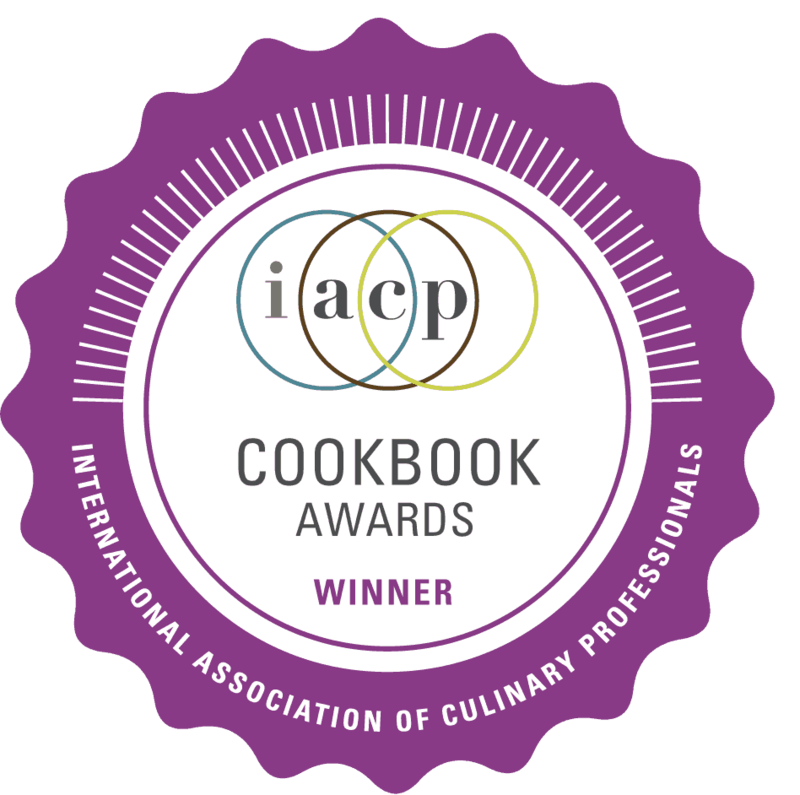 Your website is a wonderful find – thanks from sunny London! 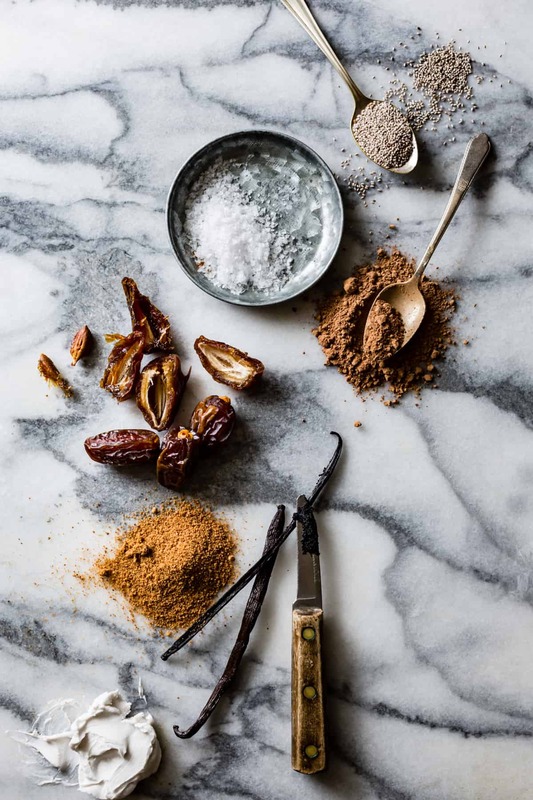 What might I substitute the coconut sugar with please…. Not sure what your criteria are, but you could try muscovado or light or dark brown sugar. Let me know how it goes! If I wanted to use almond milk, rather than nut butter and water, is it just 60ml as per the cashew butter or does the amount of additional water need to be reduced? Have everything but the nut butter in the cupboard for once! 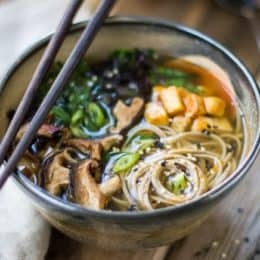 (I am assuming it is added during the initial blender stage as the cashew butter isn’t mentioned outside of the ingredients). Hi Meg, Thanks for catching my error – fixed! The original recipe calls for 1 3/4 cups of homemade cashew milk or “coconut milk of choice” which I assume means either canned or from a carton. So I would use the full 1 3/4 cups of almond milk. :) Let me know how you like it!